Original Post: It has been documented that head injuries account for more than 80% of motorcycle fatalities. A staggering percentage when you take into consideration how much money the everyday consumer invests into the protection of their head with the belief that it will save their life in the event of an accident. 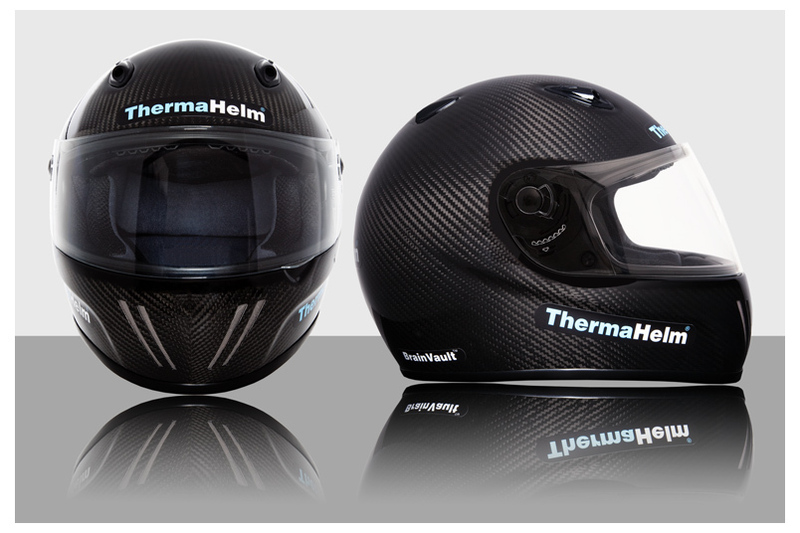 This past November our team at Girlracer took attendance at the 2010 Carol Nash Motorcycle Live show in Birmingham, England, and discovered a revolutionary new concept in helmet protection called the Halo by ThermaHelm. 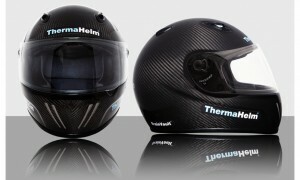 ThermaHelm has surpassed 50 years of passive technology of concurrent helmets of today by single handily reaching a new level in safety design. A design we feel, here at Girlracer, is worth talking about! What is the Halo by ThermaHelm and what does it do and why? 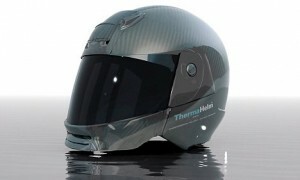 The Halo by ThermaHelm is carbon-fiber, Dupont Kavlar constructed helmet with two lightweight chemical packs built right into the liner, one is water and the other is ammonium nitrate. When these two ingredients are combined together, triggered by a sensor upon impact, it creates an ice pack effect. When a head hits blunt force and the brain is injured, there can be swelling. The traditionally used polystyrene foam found in all helmets of today act like a heat insulator and can therefore exacerbate a swelling brain. The combination of increasing temperatures and a slow medical response has been the result of most traumatic brain injury deaths. The ThermaHelm mitigates this serious problem by triggering an endothermic chemical reaction inside the helmet lining; instantly cooling the brain for up to 45 minutes while waiting for emergency services to arrive, substantially increasing the odds of survival. What’s even more impressive with the Halo is that it comes equipped with a GPS device sustained by a self-charging emergency beacon transmitter with its own docking station. This component automatically contacts emergency services in the event of a downed rider, which in itself is a major selling point for this helmet. How much does it cost and what is the longevity? 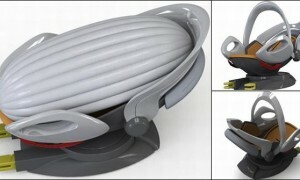 The hefty $ 999.00 (GBS 999.00 & EUR 999.00) price might be difficult to budget for some, but easy to justify with its unique “docking station.” The station sports a built-in fan which forces fresh air into the helmet with a separate sucking system that ionizes the air. This one-of-a-kind patented system helps to destroy damaging bacteria. aiding in extending the life of the Halo helmet for up to 10 years, where most conventional helmets can only offer 3 to 5 years. The 45 year-old creator and founder Jullian Preston-Powers of Brighton, England, discovered this cutting edge new concept quite by accident when a fellow friend hit his head while they were playing basketball together. Using ice-packs to cool his aching head, it soon ended up in his friend’s motorcycle helmet after being unable to hold on to it for very long due to its overly cold touch. Later, his friend put on the helmet unaware of the cold pack inside and was amazed at how soothing it felt and the ThermaHelm concept was born. A motorcycle enthusiast himself and an avid inventor, Jullian now feels a personal responsibility by calling himself a neuroprotective specialist in the world of helmet safety by promising to deliver an unprecedented degree of protection that has never been afforded to motorcyclists before now. What is the history behind ThermaHelm? 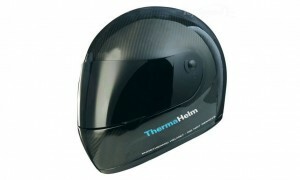 ThermaHelm has clearly knocked the socks off the helmet industry in its short time on the market, including its two years in development by being included on the 2009 Best of British Innovation Awards list. ThermaHelm has also already been accepted into the UK Trade and Investments’ Global Entrepreneurs Programme. This honour led to an impressive invitation to the House of Lords as a technology of exceptional potential. In the past 50 years helmet technology has been slow to advance with the same hard outer shell and soft liners, which, by hard fact theory, just seems to amplify a head injury. By being enlightened with this new technology it can only lead a responsible rider to think about the reality of their safety. Have we been purchasing high-end premium helmets just to make a fashion statement while avoiding helmet hair or do they truly protect our precious noggin? This reality certainly leaves this dedicated motorcyclist scratching her potentially unprotected head! Now, if I only knew what the comfort level was like…..? 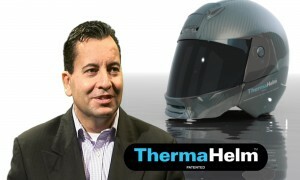 The Halo by ThermaHelm currently comes in one model and can only be purchased online. The Emergency Beacon, GPS System can be added for an additional £200.00 ($200.00 US). Look for Halo helmets to come with video and other innovative options in the near future.